A lot of parents these days are worried about whether their children are spending too much time on their computers or texting inappropriately. Advertising for everything--wholesome and unwholesome--is everywhere on the internet, and predators prowl social networking sites looking for gullible victims. The new media has become as freewheeling as the Old West. So maybe we should take a break and remember a simpler time, an era when corporate America or openly shady sorts could influence vulnerable-to-suggestion youngsters with words and images printed on paper. A public relations effort by one powerful Texas-based corporation certainly helped shape my life back in the late 1950s -- in a positive way. Like most Baby Boomers, I learned about smoking and drinking from the people we used to credit with having the power to mold children -- adults, not clever advertisers. But it was an oil company that helped fuel my interest in Texas history. I was nodding off in the easy chair in front of the TV one night in 1996 when Austin writer and historian Ken Ragsdale called shortly before 10 o'clock. "Didn't wake you up, did I?" asked Ragsdale, then an active man in his 70s. "I just got back from my four mile walk and wanted to let you know I've got some stuff I want to give you. Been cleaning out my office. You can have it or throw it away." The next day, Ragsdale helped me load several large shopping bags in my Baby Boomer Buggy, a sports utility vehicle. That night, I began digging into the bags. Ragsdale had given me some nice things for my Texana collection, including something in a white envelope that caused me to pause. The arrival of a similar envelope more than four decades ago had been as exiting as the happy day a few years earlier when my small gray plastic, baking soda-powdered U.S.S. Nautilus from Kellogg's had finally shown up in the mail. On the left side of the envelope, the distinctive lettering read: "Your Copy of Texas Sketchbook." Below that was a drawing of the famous Rose Window at Mission San Jose in San Antonio. 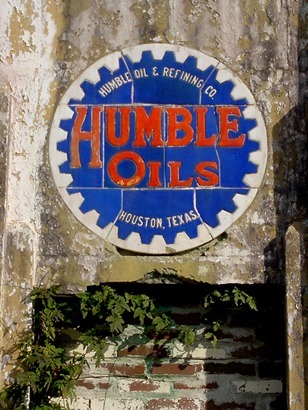 Beneath that it said, "Humble Oil & Refining Company." 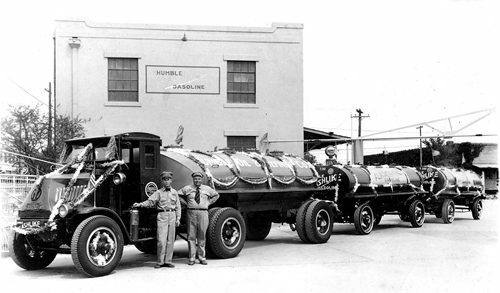 Humble, a Texas oil company created in 1911 which in the 1970s became Exxon and in the 1980s had bad luck in Alaska with an oil tanker named the Valdez, published thousands of copies of the �Texas Sketchbook� and distributed them for free to anyone who wanted one, including school kids. I used to sit and read this book in a gray Naugahyde chair with jet black iron arms and legs, a classic piece of 1950s furniture my grandparents had. It was not comfortable, but it took spilled Welch's grape juice in stride. Schiwetz's drawings portraying various aspects of Texas history were a high octane additive for my young imagination, forming impressions that lasted a lot longer than that funky chair. The somewhat cynical man holding the book looked at it differently than the chubby 10-year-old in that chair had years before. Where was the powerful, insidious corporate message in this publication? No giant business would publish and freely distribute a book without some angle. Let's see. The Fifties. An anti-Communist message? No. Anti-regulatory message? No. Buy gas from us? No. Nope, nothing like that. The anonymous corporate PR type who wrote the short foreword said only that the stories in the book, which ranged from a piece on old Spanish missions to an article on the history of the Texas Navy, had been published previously in the company's every-other-month magazine, the Humble Way. They were being printed in one volume because of "interest and inquiries from readers." The stories, the author continued, "are not tall tales of Texans who speak perhaps too pridefully of their state, but simple stories of pioneers and pioneer places. 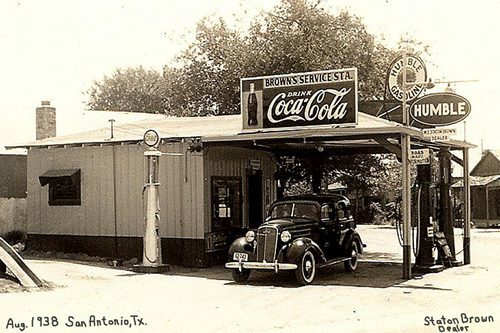 Each was checked and approved by the Texas State Historical Association." I looked at the foreword one more time. Surely I was missing something here. Then I found it. The last paragraph: "May all who read (the Sketchbook) find it a fitting memorial to the past, an inspiration to the present, and a hope for the future." With that clever 1950s corporate propaganda in mind, I've saved this copy of "Texas Sketchbook" for my daughter Hallie, hoping that someday she'll find it more interesting than manga anime �novels� or Hanna Montana and her friends. Author�s note: This column is adapted from an essay by the author first published on Sept. 20, 1996.